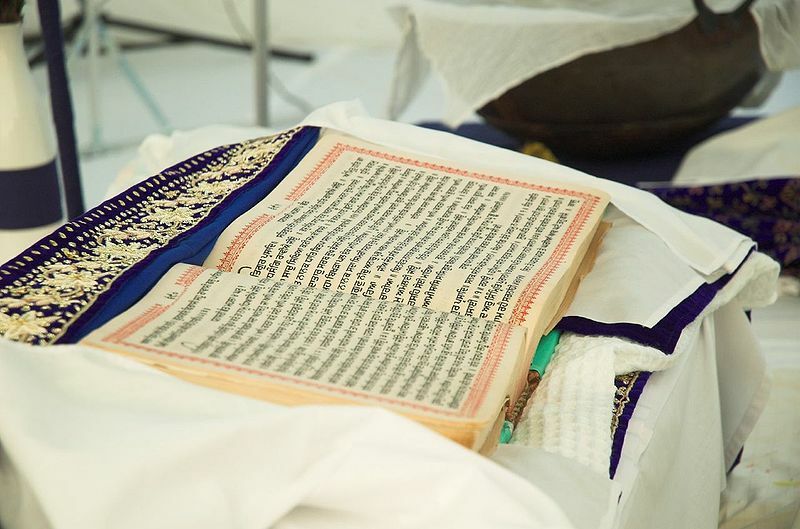 The holy book of the Sikhs is called the Sri Guru Granth Sahib and is written in Punjabi in a script called Gurumukha (meaning from the mouth of the Guru). The book was compiled by Guru Arjan and placed in the Golden Temple in 1604. The Holy Book contains 1,430 pages and 3,384 hymns. Before Guru Gobind Singh died he declared that Sikhs no longer needed a living guru but that all the wisdom they needed could be found in the Holy book, the Guru Granth Sahib. The Guru Granth Sahib is unique in that it is accorded the status of being the spiritual head of the Sikh religion. In the Gurudwara the Granth is placed on a small seat on a high platform under a canopy. A chawri is waved over it at the time of the service as a sign of its spiritual importance. The Dasam Granth is also an important book which incorporates the work of a number of poets and the writings of Guru Gobind Singh.